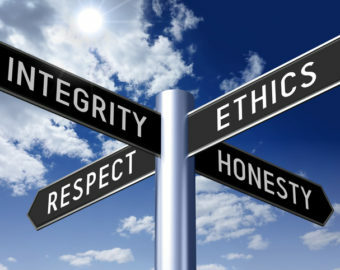 In Part 2 of the Ethics and Compliance Series, the following topics are addressed: (1) the financial benefits of an ethical culture; (2) the sentencing guidelines and mitigation benefits of a strong ethics program-including small organizations; and (3) understanding and defining the pillars of your organization. Researchers have shown a direct tangible link between the financial performance of a corporation and the alignment of the corporation’s culture with the employees’ values and the goals of the company. Many companies fail to bridge the gap between the aspirational values of the employees and aligning it with the company’s culture. What are some practical tips for starting to explore if your company has a gap and starting to bridge it? Integrity is not just honesty but consistency that employees can count on. If a company sets forth values, the managers are often on the front lines and the key question may be do those managers carry that message in their actions consistently? Early alerts to potential problems may be attainable through front line communication from employees and making sure that the relationships are present, so those employees feel comfortable coming forward not just to report bad conduct, but to alert to potential problems coming down the road. Connectivity through commitment to the organization. If employees feel valued and that what they say or report may be taken seriously and valued, they are more likely to report it. These front-line employees hear the Tone from the Top, which is translated to the Mood of the Supervisor, to them. The more the message flows and is reinforced from the top to the supervisors to the front lines, the more productivity a company will see with these connections. Example: At Outlook Law, there are weekly office meetings in which the goal is 100 percent attendance (if not, a catch-up session can be arranged and is encouraged). Just as some companies have a safety moment before each meeting, we have compliance time; whether it is on a legal issue and the reasoning behind the rule or legal ethics in general. The goal is that every person, every week, learns a bit more about a compliance issue and has a chance to speak, which they do, and it is valued. Sometimes things just go wrong and a company finds itself in hot water because of a bad actor when the company itself may be ethical and doing the right things. The U.S. Sentencing Guidelines Manual §8B2.1 (Nov. 2016) (please note this is the amended and current version) takes into account an effective compliance programs when determining a company’s culpability for sentencing (and fines) for bad actions. The following is an excerpt from the guidelines, with a full link to the guidelines at the end of the end of this piece (beware-it is 638 pages. For our purposes we will be mainly referring to pages 535-538 marked on the bottom of the page). (2) otherwise promote an organizational culture that encourages ethical conduct and a commitment to compliance with the law. Such compliance and ethics program shall be reasonably designed, implemented, and enforced so that the program is generally effective in preventing and detecting criminal conduct. The failure to prevent or detect the instant offense does not necessarily mean that the program is not generally effective in preventing and detecting criminal conduct. The purpose of the pillars is to build upon strength, but before building, the strength must be tested through self-examination. A culture of ethics and compliance makes sense from business profitability and alignment, helping a company out when it gets in hot water, and does not have to break the bank or be done all at once. There are questions to ask, steps to take, and foundations to build or strengthen. Doing so pays companies and employees dividends that studies have shown make a company more profitable and employees feel valued. Part 3 of the Series will explore basic building blocks of an effective compliance program.